Today is National Chocolate day, and nothing goes better with chocolate than BACON! 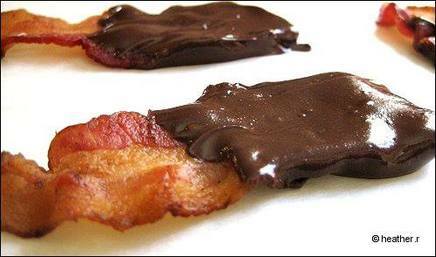 So, we are keeping it super simple with Chocolate Covered Bacon!! It’s easy enough: I put regular sliced bacon (some people recommend thick slices, but I didn’t have it on hand — the thin worked out just as well) on my grill, melted some chocolate chips in the microwave (admittedly, I used plain old Nestle chips), and then laid the cooled bacon in the chocolate and spooned it over before setting it on parchment paper. That’s it.